Ever wondered what is going through the kids minds when they first enter your classroom? Apart from the usual chatter about they did on the weekend, what happened on TV last night and the standard hustle to get their bags packed away, kids are also both consciously and subconsciously looking around your classroom to see what you’ve got in store for them. This begs the question… what do you do to grab their attention when they first walk in the door? Let’s be honest, as a teacher the first thing you’re often dealing with is getting kids to hand in their home work, settling them down, marking the role and maybe sorting out a playground incident that happened before the bell rang! This means that you have at least 5 to 10 minutes worth of ‘downtime’ in your classroom everyday that is effectively taken up by the nature of classroom management. Now when you think about it, that’s effectively between 25 and 50 minutes of face to face teaching time that students miss per week just purely because it takes time to settle the class and start your day. So, how can you claw back that lost time and still deal with the commotion that is the start of a school day? I was dropping off one of my kids at the local childcare yesterday morning and the first thing I saw in the entry corridor was this setup of flowers placed into a test tube rack. This was quite neat as Kmart is currently selling these for around $7 and they make a nice decoration to brighten up the sign-in desk where we drop off the kids. It got me thinking though… what if this same arrangement could have a longitudinal science experiment setup to demonstrate that plants have vascular tissue that transports water up the stem to the leaves and petals? Both parents and children all go past this desk on the way in anyway, wouldn’t it be great if the kids and parents could watch the petal colours change over the coming days if you added some food colour? 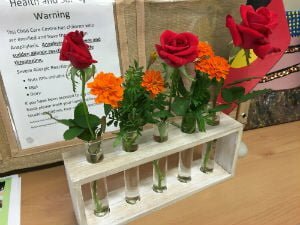 This is a standard botany experiment run in both primary and high school science lessons the world over and can easily be adapted for early learners too. Is there anything in your classroom that promotes critical thinking? So what has this got to with the beginning of a school day? Well, imagine the increased interest your students would have in the world around them if you constantly changed their learning environment by adding stimulus materials to the classroom. When the students sit down they’re going to be looking around the classroom anyway, why not have something setup where the students are actively encouraged to quickly check out what you’ve placed on a desk before they sit down? The students could then spend 5 minutes writing down their observations of what they think the lesson might be about or alternatively they could be describing the results in a daily record book for discussion later. Meanwhile you could be handling the possible playground incident or collecting homework or covering any number of the myriad of things a teacher is expected to do prior to running a lesson! Of course any suggestion such as this will take some initial planning as part of your lesson sequence and a genuine commitment to make it happen but the pay off could be well worth the effort. If students become accustomed to you requiring them to critically look and engage with the stimulus material you prepare each day, over time they you reduce the amount of lost lesson time at the start of each day. More importantly, you should begin to see the creation of a discovery mindset, where what you’re actually asking the students to do is observe the world around them rather than just blunder into class mindlessly. By the time you’re done marking the role, most of your students will have least begun the process of ‘switching on’ to being in class at a minimum which means that you can concentrate on getting the remainder of the class on task far more efficiently… which saves your time in the long run! What kid wouldn’t be excited on seeing this on a desk !?! 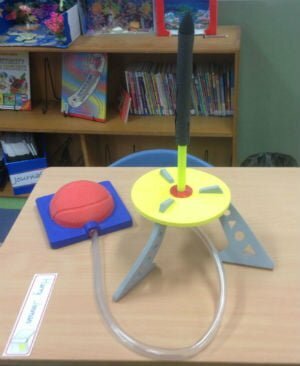 Constantly changing stimulus material in your class is simply another way of practicing teaching at its best. The kids will see that you actively care about their learning as it will be obvious you want them thinking from the moment they walk in the door. Also if you plan your stimulus material to be directly related to the science lesson you’re about to run anyway you’ll actually be getting a head start on the lesson and you’ll find that you’ll be gaining their attention without even trying. Now what is there not to love about that! Educhange 2017 wrap up – Part 2!